As students at Wilfrid Laurier University recover from Homecoming, services such as Emergency Response Team and Special Constable Services are relieved to know the campus did not suffer damages from the weekend. Jordan Brazeau, coordinator of ERT, said Homecoming was successful this year in terms of drinking-related incidences. ERT only received three calls on Saturday and one the night before, all drinking-related, but with no serious injuries. The number of incidents compared to last year’s event is about the same amount. “What it boils down to is either being drunk, or something that happened as a result of people being drunk, which is kind of to be expected for days like this,” explained Brazeau. One incident was due to a drunken fight. Brazeau also said that Homecoming is a lot tamer compared to events such as St. Patrick’s Day. Unlike St. Paddy’s Day, ERT didn’t have to overstaff as the amount of injuries were low to minimal. ERT’s quietest time was between 12 and 8 p.m., where no incidents were recorded. Tammy Lee, manager of SCS, said she’s pleased with how the day turned out for the team. “It was a very well-organized event,” said Lee. Brazeau also pointed out how ERT and SCS can successfully work together, especially on school events. ERT also said they haven’t received any negative feedback from Homecoming. Brazeau hopes that this year’s St. Patrick’s Day is as safe and successful as Homecoming. Students, even some from other universities, are also pleased with how this year’s Homecoming turned out for them. 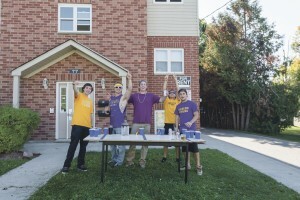 “This was my third Homecoming at Laurier Waterloo, and every year it keeps getting better. I go to the Brantford campus and it is really nice to feel at home on the Waterloo campus. I always have a great time watching the game with my Waterloo girls and meeting new Golden Hawks,” said Nicola Coldwells, a third-year arts student. Phil Lee, a third-year economics student, also enjoyed what Laurier had to offer. Although there was an incident including drinking on State Street and Fir Street, Lee pointed out how SCS’s work with both Waterloo Regional Police Service and Residence Life helped contribute to the success of the day.